Tam Tams is the name of the popular drum and dance activity held every spring, summer, and autumn Sunday atop Mount Royal. Urban lore has it that Montreal's Tam Tams, named after the French word for hand drums such as bongos, started in the '80s, maybe late '70s. According to writer Susan Krashinsky, Tam Tams began with an African drumming workshop looking for a change of pace from their usual haunt. Students ended up convening at Mont Royal Park right beside Montreal's well-known angel statue. 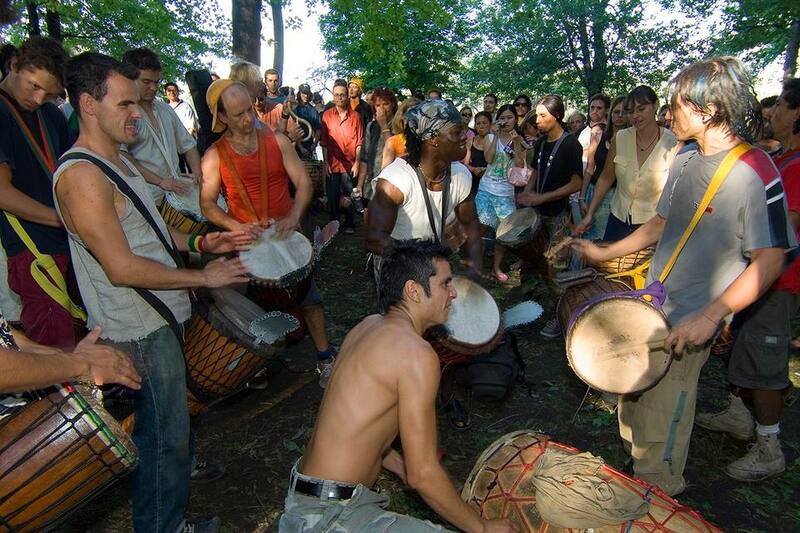 Eventually, non-drummers joined in, dancing along with the ever-changing beats and the gathering evolved to become Tam Tams, Montreal's Sunday tradition in the park. By 1994, the events grew and the city of Montreal took charge of maintenance, security and marketplace permits. Babies, seniors, teens, 30-somethings, 50-ish fans, jugglers, brazen flirts, medieval foam weaponry fighters—every generation and a wide array of subcultures are represented at Tam Tams. The vibe is peaceful and non-judgmental. It's even wheelchair accessible! And, it's free. Dogs are invited to the party too as long as they're leashed. The only constraint with Tam Tams is the weather. The show goes on every Sunday from May through September, as long as there's no rain. Drummers informally extend it through October, weather permitting. The most common public transit route to get to the Tam Tam involves taking the 11 Bus West from Mont-Royal Metro. It's just a 10-minute ride. Get off at the corner of Mont-Royal and Parc. Walk up Parc in the direction of a large patch of green space (you can't miss it!) until you reach the angel statue near the corner of Parc and Rachel. From there, just follow the beat of the drums to reach Tam Tam's epicenter. For a different route that requires less walking, take the 80 Bus North from Place-des-Arts Metro. The ride is about 10 minutes. Get off at the corner of Parc and Rachel and simply cross Parc in the direction of the angel statue. Look for the angel statue, the Monument George-Étienne Cartier. Tam Tams' drum circle typically forms in its vicinity. From noon to sundown every Sunday, things start to get crowded. It's like a huge party and practically anything goes. You'll find people playing lawn games and having picnics. The drumming continues and grows and everyone joins in by drumming (even sticks on a park bench back) and dancing. If you aren't wanting to join in, you can always people-watch to your heart's delight. After working up an appetite with all the dancing and drumming, you'll often find food trucks parked on Parc Avenue as well as ice cream sellers on bikes. If you want a bit more, head to the top of the mountain to the Mount Royal Chalet, where the café offers sandwiches, sweets, and refreshing lemonade and soft drinks and you can enjoy the view of the city. At most Tam Tams, there's a small group of people selling clothes, flags, jewelry, and assorted trinkets. Technically, anyone can set up a temporary shop, but you need a permit. If you are a Montreal resident and want to become a seller, call (514) 872-7080 between 6:30 p.m. and 8:30 p.m. on Thursday prior to the Sunday you want to sell your wares to reserve a spot. If accepted, you will then have to show up at the specified location and time to pick up your city permit. What's the Story Behind Montreal's Angel Statue?